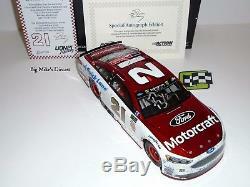 #21 Motorcraft Pocono Win 2x Autographed "Elite" Color Chrome. Diecast is painted to resemble Ryan's car sitting in Victory Lane, complete with scrapes, scratches, tire rubs, and torn up tires! Only 101 of these Special Autographed Elite Color Chrome diecasts were produced and this is #80. Ryan autographed the front window and Crew Chief Jeremy Bullins autographed the back. Both Autographs come with a Certificate of Authenticity from Lionel. P/N W211722MCRBPKCLA Lionel Adult Collectible. HOTO Hood Open Trunk Open. Realistic rollcage and soft window netting. Plus all the extras found only on a Lionel Elite. 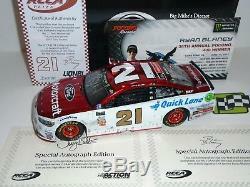 Thank you for choosing Big Mike's Diecast. 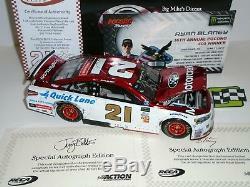 The item "2017 Ryan Blaney Pocono Win 1/24 Scale Elite Diecast 2x Autographed Color Chrome" is in sale since Sunday, September 30, 2018. This item is in the category "Toys & Hobbies\Diecast & Toy Vehicles\Cars\ Racing, NASCAR\Sport & Touring Cars". 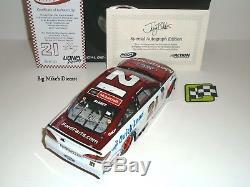 The seller is "bigmikesdiecast" and is located in Dixon, Iowa. This item can be shipped to United States.